People all over the world seem to have recently woken up to the numerous health benefits that curcumin has to offer. The spice that was once found only in South East Asian kitchens and was associated exclusively with curried preparations from the Indian subcontinent, curcumin has now gained such fame and glory that it has won prime spots on shelves of popular coffee shops like Starbucks. What Western civilizations are realizing today has been part of ancient Ayurvedic knowledge for centuries. Curcumin was always hailed as a superfood by ancient Ayurvedic medics and was used to treat wounds, bring down blood pressure, detoxify the liver, improve digestion as well as accentuate skin health. What makes it a unique remedy is the fact that it comes with no laundry list of side effects. Curcumin is a polyphenolic pigment that is a part of turmeric and is responsible for giving turmeric that lovely, festive yellow tone. Curcumin possesses many therapeutic properties in itself and is known as the reason behind turmeric’s meteoric rise. For children, curcumin can be extremely useful too especially since it is so harmless, unlike many other drugs including those that contain acetaminophen. Children do not have a fully matured immune system and so they are more vulnerable to diseases and sicknesses as compared to adults. Besides, children tend to get many cuts, scrapes and wounds as a result of the thousands of times that they tumble in a day. Keeping all of this in mind, a curcumin supplement given to children daily can be a very good proactive measure to keep them fit and away from harm’s way. Strengthens the Respiratory System – Curcumin has anti-inflammatory, expectorant, and anti-histamine properties that can help relieve symptoms like breathlessness, wheezing, coughing, congestion, and chest inflammation. Children who are prone to allergic rhinitis or asthma or even seasonal flu can benefit a lot from taking a curcumin supplement every day. Most children tend to be naughty and are very susceptible to cuts and scrapes during the course of a day. Curcumin can be applied as a topical ointment as well as consumed orally to expedite the wound healing process. The anti-inflammatory and antioxidant properties of curcumin are very good at sealing up a wound quickly while its disinfectant qualities ensure that there are no infections. Curcumin improves the functioning of the brain and has neuroprotective characteristics that help in sharpening cognitive abilities. By increasing the quantity of BDNF protein in the brain as well as by stimulating the production of serotonin and dopamine, curcumin can also relax a child’s mind and body, therefore, encouraging proper overall growth. Curcumin is great at inhibiting nosebleeds. A paste made using curcumin powder and ghee can be applied to the nasal lining to ensure that it is moisturized. This remedy is also useful in disinfecting sinuses. A curcumin solution can also be used to clean eyes when suffering from conjunctivitis. The anti-microbial properties of curcumin help get rid of conjunctivitis causing pathogens. Curcumin helps build a strong immune system that is capable enough to ward off infections by itself without any external help. 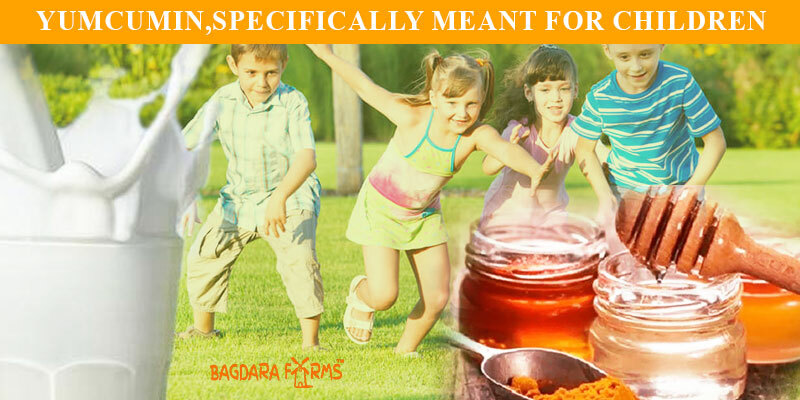 Yumcumin, a wonderful curcumin supplement created by Bagdara Farms, is specifically meant for children. It can be consumed every day with milk and a dollop of honey. The mild flavour of curcumin is usually quite well-liked by children and the medicinal properties that it possesses are very helpful in keeping them fit and healthy all through the year. 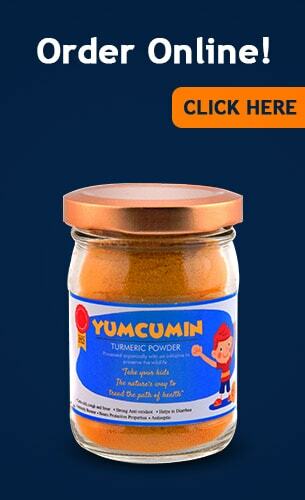 Besides, Yumcumin is made using organic curcumin that is free of chemical residues and adulterants. As a result, it is pure and absolutely safe for children of all age groups. Giving your child a daily dose of curcumin will help him stay away from diseases today and stay strong and healthy throughout his life!